Home » Uncategorized » Europe’s next independent state? THE banner in Barcelona’s central Placa de Catalunya square reads: “Catalonia, next independent state in Europe”. After a huge, peaceful march with flags and banners through the city on September 11th brought together an estimated 8% of the region’s 7.5m population, a once-exotic idea has suddenly come to life. Artur Mas, the Catalan nationalist leader of the regional government, publicly backed the marchers. “This cannot be ignored,” he said. “Catalonia needs a state.” In one recent opinion poll, 51% of Catalans say they would vote yes to independence. Even some non-separatists now believe a referendum is needed. Yet Spain’s constitution does not allow splits and that is setting the country and its wealthiest region on a collision course. Mr Mas has been overtaken by events. Nobody expected the marchers to be so numerous (Barcelona’s La Vanguardia, a daily, sells “I was there” photo CD-ROMs). He was already due to meet Mariano Rajoy, the Spanish prime minister, on September 20th to demand a long-term tax rebate. Mr Rajoy, more worried by a recession that has left a quarter of Spaniards out of work, had been expected to hoof the idea into the long grass. Independence gets even shorter shrift. “The reply is in the constitution and our laws,” said Mr Rajoy. These could be changed, but only with difficulty and a bitter debate. Yet a no to his tax demands now would boost separatist sentiment further, Mr Mas warns. If snubbed, he may call elections, which would become a vote on independence. Separatists are excited, though the polls are misleading. Whereas one-third of Catalans are convinced separatists, many others are simply enraged by their tax money propping up poorer regions. 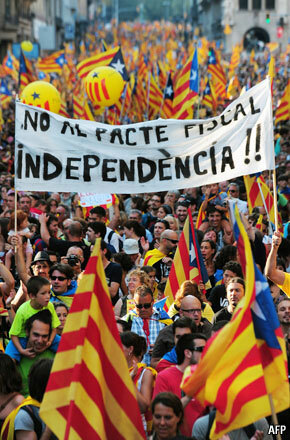 Eight percent of Catalan GDP, or €16 billion ($21 billion) a year, is siphoned off, they claim. As regional health and education cuts in Catalonia bite, they feel mugged. No one now doubts that Mr Mas’s once-ambiguous Democratic Catalan Convergence party seeks independence in the long term, but it tends to negotiate incremental advances. Its middle-class voters instinctively hate confrontation. “It is like wanting to leave home without making Daddy angry,” says Pilar Rahola, a former separatist deputy. And they hate instability. Memories of a civil war in the 1930s, in which separatism loomed large, are too painful. That is why Mr Mas recoils from the independentista or secessionist tags. “I am a sovereigntist,” he explains, adding that nobody is independent within the European Union. A smooth transition to separate EU membership would require rule changes in Brussels and Madrid. They may never come. In the short-term Mr Mas demands a radical, but initially financially neutral, change to the tax system—allowing his government to collect taxes and send them to Madrid, rather than the other way around. Catalonia could later cut its contribution. For nationalists, this would be another step towards independence. A third way, proposed by local socialists, is a new federation in which Catalans would negotiate a special bilateral relationship with other Spaniards. Some 28% of Catalans prefer that. A “no” vote at referendum would take much, but not all, of the sting out of Catalan complaints. Francesc de Carreras at the Barcelona Autonomous University, an anti-secessionist, says a vote would allow a proper debate and add democratic weight to decision-making. Canada’s 2000 Clarity Act, allowing Quebec to vote first and negotiate after, provides a model. Regional governments, which spend almost 40% of public money, blithely ignored deficit targets last year. This year they will still push Spain some 0.7 points above its 6.3% GDP target, set in Brussels, predicts FEDEA, a think-tank. Mr Rajoy passed a law allowing the centre to intervene in the finances of poorly performing regions. The prime minister may now be too scared to use it. The direct causes of Catalonia’s economic woes are recession and ruinous administration by previous regional governments. Independence does not change that. It’s not yet clear whether separatists are, as Spain’s king claims, merely “chimera chasers”.